Hope you all remembered to put your clocks on one hour this morning – summer is now here especially in Condado de Alhama. We are looking forward to sunny evenings sitting on the terrace watching the twighlight golfers go by. Friday was sunny and for a change, no wind. This was reflected in the scores with 4 teams on 40pts, 1 on 41pts, 5 tied on 42pts and 3 teams on 44pts fighting for 2nd and 3rd place. However they were all blown away by the eventual winners, Craig Matthews and Ian Gibson who amassed an incredible 51pts! Next week we are leaving Condado empty and playing at Hacienda del Alamo who have given us a great deal and really appreciate our custom unlike Olagolf who do not treat us as well as other visiting societies. We have booked 40 places and once they are full we will not be able to accept late entries this week. We will all meet on Friday in the terrace bar for coffee at Hacienda at 09.00. From there we will be taken to the academy course for a short game skills event and free range balls. A buggy is included in the price of 39 euros and they will prepare our cards and display our names on the leader board by the 18th green. Also included are 2 free greenfees which we will use for prize money for the day so there will be no competition entry fee. I am sure I will have much to report next week and no doubt I shall have some photos for you. Following the success of St Patricks night at the Clover, the staff have kindly agreed to continue the 10 euro beer bucket offer on Fridays. They go down so well and when shared give a great party atmosphere! I have been contacted by the Mar Menor golf society who want to challenge us for a trophy at Saurines de La Torre. I am sure we can arrange that and it should go ahead within the next couple of months. They are also very unhappy with Olagolf who have withdrawn their annual membership and not reintroduced it as they have at Condado. On Friday about 40 golfers and friends had a great night out with a Rod Stewart tribute act at Camposol golf club. Cath is doing a great job of organising these events with next one on Thursday March 31st at Scot’tees for their monthly curry night and quiz. After the Graham White pairs event on Good Friday we will be at Trevis for a buffet and entertainment by El Tel (shouldn’t we be spending all this money in our own clubhouse?). Our major competitions will be coming up in the next few months so any sponsorship will be welcome. We have just received news of the attractions to be included in the Paramount theme park 5 km up the road and they look fantastic! This is a positive development for us all at Condado and should promote additional facilities in the area (a clubhouse?). Phil is looking to redesign our front page with links to topics of interest. Keep checking over the next few days to see the changes. A change to the scheduled day today to accomodate our Irish contingent. 41 players attended our St Patrick’s day individual stableford competition. It could have been more but a few of our regulars were missing. A lovely sunny day meant most players were in shorts, but the strong winds meant scoring was difficult. My own score of 30pts could have been so much better without 3 putting 10 of the greens, but I am sure many other players had similar stories! It was difficult enough with the conditions, but things got tougher still for Paul Briggs who saw his excellent tee shot on the 11th settle onto the middle of the green. It was then picked up by a mischievous seagull who then chose to fly over the lake and drop his ball right in the middle! After a debate we decided to replace his ball which was as well as Paul turned out to be the winner of the competition! Men No winner – marker blew away! Thanks to Fred Twomey who provided every play with a golf ball on the 1st tee with a clover emblem on it. Not many of these balls reached the 18th hole though! Fred also did an excellent job of announcing the winners and presenting the prizes. These were Jamesons whisky, Baileys Irish Cream and packs of draught Guinness. A complaint from me though. Out of 41 cards returned 15 only had gross score on (no points and no total) which made it very difficult for me to work out the scores. I had to check every hole on every one to work out the scores (270 holes!). Also one card was not returned and we had to delay the presentation until we knew what had happened to it. Another had no handicap on and the player wasn’t present. One card only had points on and no gross. Yet another had marker’s score in players space. The most difficult decision was one player had by far the best score but could not be given a prize because they hadn’t con formed with the rules of our constitution. It was their 1st comp with us but they did not come to the presentation and did not provide proof of handicap. When we make rules we have to stick to them. So about half the cards caused a problem and with Phil at a presidents meeting and Graham dealing with entry fees and membership payments it delayed everything. I think it is amazing that we normally check the cards and present the prizes within an hour of the Clover opening. We won’t be able to have a presentation on the same day if things don’t improve. That’s my rant for today! We are pleased to announce that after pressure from the society and individuals Olagolf have reversed their decision to close membership deals at Condado and Saurines. (Mar Menor has not been reversed). But only single course membership is now available. They are looking at introducing a 20 year membership deal but no details are yet available. I said last week that Olagolf have informed us that the clubhouse is starting, and workmen will soon be here. I have now been told that it will be a temporary clubhouse – but i suppose that is better than nothing. It will be in front of the buggy storage building to the side of the chipping green. Obviously we are looking forward to the facilities but it will also be much better for the shop staff and course marshalls. Graham has only a few weeks of his captaincy left and I will take over as captain on May 1st. I shall probably have a captain’s drive in comp on Monday May 2nd. I am pleased to announce that Kevin Smith has agreed to become my vice captain and he will take over on May 1st 2012. Kevin is a permanent resident and has been an Olagolf member since the course opened last year. His wife Cath is a valuable member of the committee being the social secretary and helps bring our community together. The both have provided the winners certificates over the last year and I am sure the winners in that time appreciate that. I am sure he will enjoy the involvement which the position requires. Our thanks go to the treasurer Phil Tann for adding a web page translation tab to our weekly newsletter. We now have a choice of english, norwegian and spanish. We know most norwegians speak very good english and show us brits up, but I am sure they will appreciate a choice. I also hope this will attract spanish golfers to our society when they can understand what we do and our role in developing our community. On the competition front I am proposing a couple of changes to our summer fixture list. Captains day last year was a traditional individual stableford. But this year I would like to see it change to a 36 hole championship (maybe thursday and friday) which will make it more of a challenge and then the winner can truly say they have deserved it! There will also be divisional prizes, best rounds each day and the usual nearest pins, longest drives etc. We will be having a night out with entertainment for the presentation and if anyone can provide sponsorship for this event please contact me on my new email address: barrybarker46@yahoo.co.uk or ring 0034 968328006. It is 2 weeks away from our society day out at Hacienda del Alamo. A very good course with great facilities for about 36 euros including buggy. This is a protest against Olagolf who treat visiting societies better than ourselves. Put your name down as we need a minimum of 20 players. The captain is donating an annual cup for the Graham White pairs strokeplay event which will be played on Good Friday. Again please put your name down ASAP if you are available. After the comp we are having a night out at Trevi’s restaurant Camposol with a buffet and entertainment from El Tel. Transport can be arranged. The course is looking good with the rough getting tougher. We have already started losing our balls in it! The greens have been hollow tined and filled with sand but the holes are smaller than last year. They are still very fast though. It looks like all the lakes have been filled now. This week it was a should have been a 3 person texas scramble with 36 players taking part. However the rains of Thursday which continued overnight meant the competition was cancelled. There were a few hardy norwegians still went out but us local spaniards can wait for the sun. Some good news this week regarding the offer to our members from Hacienda del Alamo. On top of the excellent society deal for about 36 euros and the all year price of 35 euros with your membership card, they have given us courtesy of the course for our captain for the year. This is what we asked of Olagolf and they didn’t reply. If you do want to take advantage of the 35 euro deal you will need your CDAGS membership card and your handicap certificate. If necessary I can provide you with a CDAGS certificate. Also you need to phone Hacienda first on 0034 968157236 to arrange your booking. If you want your membership card ready when you arrive at Condado, email either myself or Phil Tann with your arrival date at barrybarker46@yahoo.co.uk or phil@kigai.co.uk We have had 484 different golfers played with us over the last year. About 100 of those have already paid their membership this year and it is only 11 days since the fee was due! I have received a reply from Olagolf which does not address any of my questions except that of membership. There was a meeting with the banks (RMI) last Thursday where Olagolf were trying to get them to reverse their decision about membership. It seems that the directors of the European PGA tour have been to Condado and liked the set up, but won’t come without a permanent clubhouse. Many of the critical things we need to progress will not be possible without the clubhouse as a base. We are still awaiting news of the outcome but hope the banks will see sense. Really miserable weather this week with rain coming Thursday. The rough grass adjoining the fairways is starting to grow and the dormant (brown) grass on the fairways and 1st cut of rough is starting to show patches of green. Next week is the St Patrick’s day competition on March 17th (individual stableford). Prizes will be typically Irish – Jameson’s whisky, Baileys Irish Cream, Guinness etc. There is a St Pats promotion on in the Clover, so we will stay there. On Good Friday April 22nd Graham is having his own major competition – a pairs stroke play event. It looks like some golfers are not happy about strokeplay but this is a major competition which will sort the men out from the boys – only the best will win. In England every monthly medal was strokeplay plus many other comps so I don’t think having 2 strokeplay events a year should be an issue. Graham has booked Trevi’s for the presentation and buffet with live entertainment (trying to get Woody who is highly recommended). We will give more details ASAP. The hacker has contacted all my contacts (over 100) using my name to ask for 1850 euros to pay my hotel bill in Spain. I had lost my wallet and phone and the police and the embassy wouldn’t help me. I mustn’t have many friends as no one has paid the ransom! But thanks to George Hoskins though who offered his one euro to the rescue fund. Any male golfers who get grief from their wives when they play with the society be aware there is now a Marks & Spencers outlet next to Kwiksave in Camposol which they can visit. Don’t forget next week we play Thursday not Friday. This week we were back to the individual stableford. 36 players took part but the bad weather forecast for the day frightened off a few players so it could have been more. As it happened, the rains never came and the day was fine but cold. The chill caught a few hardy players out – although for a few holes the sun came out and others then looked overdressed! A few players in the 1st division will be regretting those missed putts which at the time didn’t seem to matter with such achievable scores taking the money. The new society constitution began on March 1st so all players needed to be members to play with the society. Anyone who has not joined please pay your 5 euros on Wednesday night or as a last resort in the Clover before the presentation. You will then get a membership card which will be useful as you will find out later. The new membership list on this website will now only show paid up members so if friends or relations are coming over get them to pay for you. Since last week the lakes by the 10th and 13th have been filled and now look much better, although it would be nice if the green slime around the edges was removed. 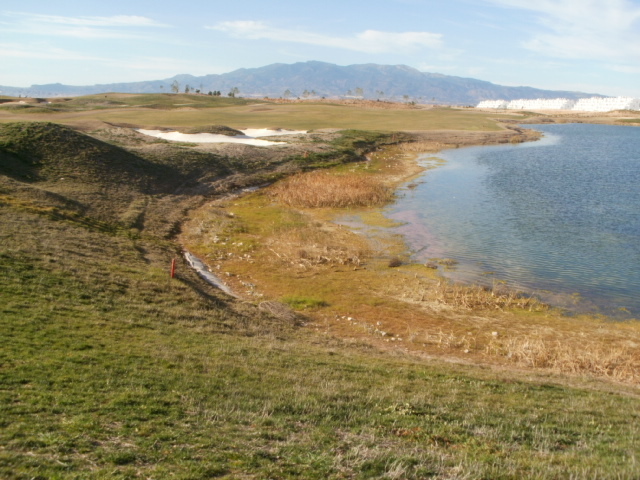 The lower lakes on the 4th, 5th and 18th are still very low. The greens are in great condition, very fast and almost unplayable with tricky pin positions. The swallows have arrived, so summer might be on the way. We have recently discovered that other societies visiting Condado are given free golf for the organiser and golf vouchers for prizes. I have emailed Olagolf several times over the last 3 weeks asking for similar treatment but still have not received a reply. Our society bring on average about 45 – 50 players a week to Olagolf on Mondays and Fridays so we feel a reply is the least we could expect. They have also discontinued the annual membership offer without notice and no alternative as yet. The members whose renewal was due shortly are not amused. this is very short sighted attitude – do they think that members who play 3 times a week are going to pay 3 green fees a week – I don’t think so! Therefore although Condado is still our home course we will on occasions take our business elsewhere. Our 1st trip out will be to Hacienda del Alamo (just up the RM2) on April 1st. Another date has been booked there in May. And now back to that important membership card. An agreement has been made between Hacienda and ourselves for special rates of play. If you produce your membership card for Condado de Alhama and your handicap certificate you will be able to play Hacienda throughout the year for only 35 euros. The current peak season rate is 59 euros. They also offer a variety of membership offers which our disgruntled members may want to look at. One fee, no 7 euros per game. It may seem I am trying to entice our players at Condado away but no – just asking Olagolf to open their eyes and compete. Bring that clubhouse on NOW! This how Olagolf should treat us. Hacienda have a superb clubhouse, 3 teaching professionals currently doing deals at 25 euros each or cheaper for groups. Summer twilight price is 25 euros. There is a golf director on site who will listen to queries or complaints. At Condado we have nothing and do all the work ourselves to make our society successful. We are having to go elsewhere to get the deals Olagolf should be giving us. Are you listening Olagolf? Unless Olagolf become more professional we will arrange many more awaydays on Fridays leaving them an empty course. Next week is a 3 person texas scramble and the sheet will be in the clubhouse or alternatively email me at barrybarker90@yahoo.co.uk The following week the Friday competition has been moved to Thursday (no Friday comp on the 18th March). The reason for this is some of our Irish members wanted to play a comp on St Patricks day (March 17th) as they wouldn’t be fit to play on the 18th! We were glad to agree to their request. Cath may organise a night out after, although there is a St Patrick’s night party at the Clover from 4pm with 12 bottles of Estrella for only 10 euros!